After many years putting up with leaking wheel cylinders, constantly having to adjust your rear brakes and handbrake, finally there is an affordable solution. This new conversion is designed to be a simple, comprehensive kit for direct replacement of your old drum braking system. Several versions are available to fit any Volkswagen type 2, T3/T25 (including syncro but please state wheel size when ordering) or split bus with bay IRS conversion, as long as you have 15" rims or larger. Even when correctly adjusted, if you use your bus for towing, touring, or occasional use, the inefficient drums can cause problems, now this is easily overcome with the Ultimate Engineering rear disc brake kit. We have specifically designed this product to utilise quality modern parts, which combine both safety and efficiency with maintenance free motoring. Each kit consists of new parts including OEM quality discs, genuine calipers, hybrid cables and all bolts and bracketry. 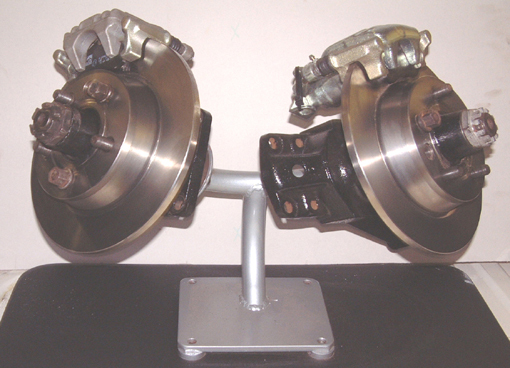 It also contains a pair of modified hubs that are exchange items. You can either send us your old hubs first, or we can supply ready modified hubs for an additional £100 surcharge. You will get this money back when we receive your hubs. Easily installed by any competent, DIY mechanic, and without the need for specialist tools or equipment. Alternatively, if you do not feel confident yourself, we offer a full fitting service at a reasonable rate for UK customers. Please add £20 if you need the rear caliper braided hose upgrade. All parts in stock and ready for shipping (post and packaging £25).